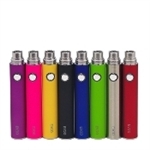 Kangertech manufactures top of the line e-smoking products. EVOD batteries available in manual and automatic 320mAh, 650mAh, 1000mAh and 1600mah. Quality and attention to detail make Kangertech one of the World's best batteries.